Need 1987 Honda Elite CH150 water pump shaft - The unofficial Honda Forum and Discussion Board Forums For Honda automobile and motorcycle enthusiasts. I have torn down the engine of this 1987 motor scooter due to a mechanical rattle, and found that the water pump shaft is broken. I tried to buy one at the Honda dealer but it has been discontinued. The part number is 19231-kj9-010. A picture is attached of the broken one. It is 101 mm long. Can anyone help me? Last edited by Rick10; 09-06-2017 at 12:37 PM. The "related topics" below are not related. 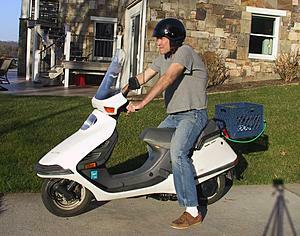 This is about a motor scooter, not a car. Last edited by Rick10; 09-06-2017 at 12:38 PM.